Matthews House Movers is an experienced, professional business that has been in business since 1867 moving and lifting buildings. We have the equipment, experience & expertise to do the job right. If you have an need, call us today at 585-328-2443. 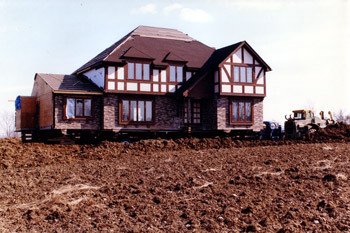 We have experience moving houses, cottages, historical buildings and other structures of all types and descriptions. Raising Buildings: We can raise your building to increase the headroom in your basement, or even replace your crawlspace with a basement. We raise all types of buildings, including year-round homes, cottages, commercial buildings and barns. Structural Support: We add steel beams and columns to existing buildings to prevent floors from buckling and roofs caving in. We level floors and houses where the supports and/or foundation is sinking.